Aldgate is an vibrant area with a mix of residents as well as being popular with many City professionals because of its convenient location. And in the heart of this new financial district you’ll find Smaka. The building itself is a modern high rise. It’s then quite charming to find a warm and friendly Swedish eatery occupying the ground floor. 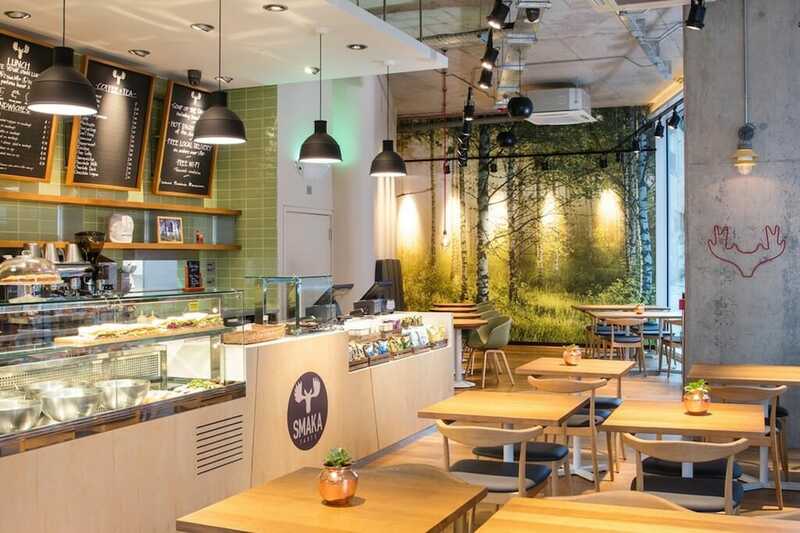 Perhaps the most striking feature of Smaka’s interior is an entire wall covered in a mural of a Swedish birch forest themed with Nordic design furniture and decor, exposed wood and beautiful lighting, this inviting restaurant offer a break from a otherwise busy city life. “Did you see they’ve got ‘Vargtass’!” my dining companion exclaimed, after having had a look at the drinks menu. We ordered two of this classic Nordic cocktail which is a mix of vodka and lingonberry cordial, topped with ice and frozen lingonberries. It was even better than expected. Whilst sipping on our cocktails and nibbling on the rye bread and rye crackers served by our Swedish waiter we browsed the menu featuring six startes, six mains and five desserts. He went for the ‘råraka’ with arctic char roe, sour cream and red onion whilst I had the ginger cured salmon. Both delicious, but if I had to pick one, I’d go with the råraka which is a rather flavoursome potato pancake dish. We then moved on to our mains, he had the crispy salmon served together with sweet carrot puree, baby spinach and new potato with brown butter and dill sauce. All well cooked and beautifully presented. (I think again he chose the best dish for mains!) I enjoyed the juicy and tender lamb shank served with carrots, a chanterelle risotto and red wine juice. Although a nice dish, the risotto was slightly runny and the cheese could have been melted into the risotto before serving. Then puds arrived and I forgave them instantly. Lots of fresh, sweet blueberries had been thrown into this otherwise classic crumble pie, cooked to perfection and served appropriately golden and crisp with vanilla sauce. I left the vanilla sauce on the side and cheekily stole my dining companions home made cinnamon ice cream instead, which I thought balanced this otherwise completely yummy dessert in a beautiful way. He had the rice pudding, served with cloudberries. An interesting combination that surprisingly worked very well indeed. The evening was rounded off with two espressos – before leaving this tranquil Swedish oasis and walking out, into the winter night and the busy streets of London. The restaurant is a only moments away from Aldgate East tube station, in Alie Street, just off Commercial Road. Go there for great Swedish influenced food, relaxed atmosphere and attentive service. The restaurant also has high chairs and changing facilities in the bathroom, making it suitable for families. Opening times: Monday 8am – 4pm, Tuesday – Friday 8am – 11pm and Sunday 10:30am to 11pm.